Essential tools and resources COM, COP and COGS students. NEOMED Library offers a welcoming space for study, learning, and research to all students. We are located on the second floor of the "A" building with a quiet study space that extends into the "R" Building. Our main entrance is accessible from the second floor of the "B" building, across from the Department of Psychiatry. In addition to our core collection of books, journals, and anatomical models, the library houses a variety of study spaces and resources available to all students. These spaces include, but are not limited to: the QUIET Study Area, a number of public computers and printers, and a series of study rooms available for reservation. The Library is accessible 24 hours a day and 7 days a week with your NEOMED ID badge. All electronic resources are available without authentication while on the NEOMED campus. Authentication is required to view library resources when off-campus, and this includes journal databases. Select the "off-campus" link, and a new window should open with a login page (pictured below). At the Login page, type your name and library barcode and click on the Login button. Your name will be your given name (last name only for most databases). Your library ID number is your student ID number. You’ll need to enter the zeroes; the system wants an 8-digit number not including the @. If you ever forget your ID number, stop by the library or call the Information Desk at 330-325- 6600. Again, please contact the library in person or by calling 330.325.6600 during normal business hours to request your barcode. Authentication is required to view library resources when off-campus. Search the online catalog for the title. Select the off-campus link when viewing the item in the online catalog. At the Login page, type your name and library barcode and click on the submit button. You will be asked to authenticate with your name and library barcode if you are off-campus. Please contact the library in person or by calling 330.325.6600 during normal business hours to request your barcode. 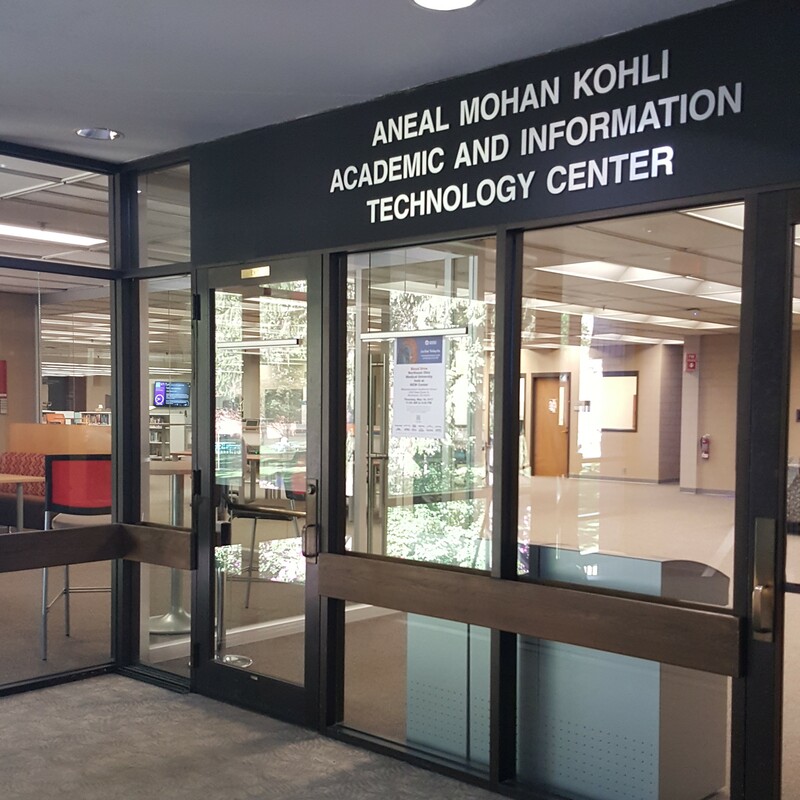 In addition to the open seating available throughout the library, there are a variety of individual and group study spaces within the Kohli Center. For photographs and descriptions, see the Study Spaces guide. Black Room - There is a large monitor and computer with the Biodigtal 3D Human software. Comfortably seats 18 - 20 individuals. Blue Room - whiteboard table, glass boards on the walls and a large display screen for laptops. Comfortably seats 14 - 16 individuals. Quiet Study Area - Study carrels, bistro tables and movable white boards are provided for your use. Your My Library Account will show you what materials you have checked out and you can renew them online. Help Desk staff are the first point of contact for library and technology related services and will resolve or elevate all library or technology related requests as appropriate. The library has 12 public computers stations available for student use as well as large monitors and computer terminals in most of the study rooms. Feel free to bring food and drink to the library, but please clean up after yourself. Hot and cold filtered water and a Keurig coffee/tea vending machine is available in the library. Please be respectful the students studying in the Quiet Study Space and try not to use this area as a shortcut to other areas of the university. We are the first point of contact for library and technology related services and will resolve or elevate all library or technology related requests as appropriate.